Cast on a multiple of 14 stitches, plus 1. Row 1 (RS): Color A, knit. Rows 2, 3, 4, 13, 14, 15, and 16: Color A, knit. Rows 6, 8, 10, 18, 20, and 22: With B, purl. 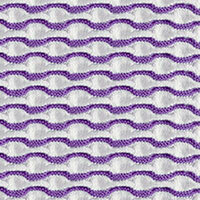 Row 12: Color B, p4, * (tuck stitch) 7 times, p7; repeat from * to last 11 sts, (tuck stitch) 7 times, p4. Row 24: Color B, (tuck stitch) 4 times, * p7, (tuck stitch) 7 times; repeat from * to last 11 sts, p7, (tuck stitch) 4 times. 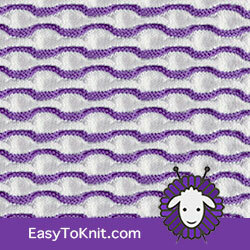 Thank you for visiting www.EasyToKnit.com - Happy knitting!